For many people, the Mt. Whitney region is quintessential High Sierra, the end of the John Muir Trail and the highest point in the 48. For others, the Incredible Hulk, with Yosemite-quality climbing in the backcountry is the best the Sierra has to offer. Those more romantically inclined will name Tuolomne or maybe the Evolution range as the Sierra’s best for their incredible beauty. For many in Pullharder, Lone Pine Peakis the Sierra’s gem. But for some of us, the Palisades are synonymous with this great range. And the best way to take it all in is to climb ‘em all. Spire after spire, summit log after summit log, the Full Palisade Traverse is the biggest climb in the Sierra and probably also the most spectacular. Six 14,000' peaks, famous in their own right, plus the Palisade Crest all set amongst the backdrop of the historic Palisades School of Mountaineering. And the fact that it’s the most recognizable and iconic ridgeline in the Sierra. Plus the fact that the climbing is generally really, really good. Our plan was to climb the Full Palisades traverse casually, fully enjoying this most iconic of Sierra climbing. What is hard or what is fast depends on the climber, but what is casual should follow a couple simple rules: no night climbing, stay always in good spirits, and no type II or type III fun. We were able to follow those rules with the exception of one section of heinous chossy rock between Norman Clyde Peak and Middle Palisade and one evening of panicking when we thought we had lost our only lighter. Otherwise, our almost 70 hours in the backcountry (climb plus hike-in and hike-out) was pure enjoyment. It's hard to make such a big route seem casual. But strong partners with good attitudes were able to make it happen! While the best-traveled section of the Palisades is Thunderbolt to Sill, the dozen Lord of the Rings spires, aka Palisade Crest, is the best chunk of ridge in the Sierra, bar none. 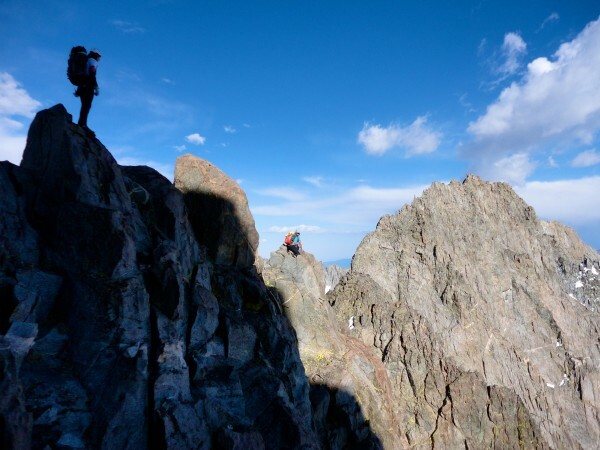 Yet it’s rarely done as a climb on its own.The only summit entries on the spires were from full Palisades Traverse attempts (the last being 2009). Why don’t more people make Palisade Crest an objective, just this amazing ¾ mile section of ridge? The ~1-mile Thunderbolt to Sill Traverse is what most people mean when they say Palisade Traverse, but the Full Palisade Traverse is 8 miles and allegedly 70,000’ of climbing between Southfork Pass and Bishop Pass. Supposedly the biggest pure rock traverse in the world. Six fourteeners and countless thirteeners towering above the Sierra’s biggest glaciers. Doesn’t sound casual. We’d have to move quickly, solo most everything, and move well as a team. But we’d do it without ever digging too deep. Type I fun the whole time! Brad, Gil and I completed the traverse in early June this year. What a route to warm up for the Sierra Summer! We decided to do it North to South (Bishop Pass to Southfork Pass), even though all ascents of the Full Traverse we had heard about had gone South to North. Why did we not go that way--because we are freaks who refuse convention at every corner, especially for fashions? Yes, that. Also for some better reasons. Due to the early season conditions, we thought it would actually be easier (more casual) North to South. Our logic was that Bishop Pass is easier to access and so we could get away without crampons or axes going that way, sliding down SouthFork pass on the way out. Also, in the Sierra many of the north faces are steeper and better to upclimb rather than downclimb or rappel, so we could take advantage of that. Plus I had already traversed Thunderbolt to Sill a few years ago and Gil had traversed Winchell to Sill. So we knew that part of that climb in that direction, and would benefit from nice frontal-body suntans facing south the whole way! I do think this direction is better. Though you get the cruxes (PalCrest) and rotten rock near the end, when you’re tired, the cruxes are all manageable, so I don’t think it’s much of an issue. The first day we hiked in in the evening and bivvied at Bishop Pass. My alarm failed to go off so we got a relatively late start at 6am the next day. Agassiz was loose low but quality higher up. It was definitely not 3rd class on the descent, neither was Winchell. I was also feeling the altitude-- on my first trip to the mountains this season. Despite the fact that Gil and Brad have been known to "party hard," they're still both mountain beasts and would expect the same from me. Luckily they were merciful and agreed to go at a "fun" pace. The section from Winchell to Thunderbolt took a long time. Definitely mid 5th or higher and sustained. Then we took turns assaulting Thunderbolt's summit block sans rope, supposedly the traverse's hardest moves (it’s not, at least the traverse route we chose). The classic T-Bolt to Sill section took only 3 hours. We found that climbing as group of three was always fastest when we stuck close together, not letting somebody lag and have to repeat the routefinding. We were overjoyed quickly descending the Class 4 golden granite of Mt. Sill and we summited a couple more unnamed peaks on our way to Jepson. There, some amazing 5.10 splitter cracks on the North face of Jepson allowed us to pull moves right onto the summit. I think keeping it at 5.9 as the route is rated is possible in chimneys or other options, but those 5.10 cracks were secure and way too good to pass up. The first was 5.10- but the next one solid 5.10...Brad tied the end of a 8mm rope around his waist, made short change of the ringlocks crack, and brought up Gil and I. We made the 2nd class descent to an amazing pass right at dusk and bivied there. 15 hours. Day 2 we also failed to wake up on time (Gil was secretly happy about sleeping longer) but we weren’t really rushing so there was no problem. We were really stoked to get to the route’s supposed technical crux, the spires of the Palisade Crest, each with a little summit register. The dozen amazing summit-spires of the Palisade Crest, all named for Lord of the Rings' characters are all 5th class but all reasonable to solo up and down. And most of the summits are unavoidable completely, with gnarly walls and ribs dropping steeply to either side. Especially North to South, the climbing is excellent. The Crest took us three hours. But there was still a lot more climbing that day. Getting to Norman Clyde took a very very long time, and we were getting tired and it’s deceptively far. This was the only part of the route that kind of dragged. But at least the rock was good. That was about to change. We had wanted to make it in 2 days but our late wake-ups, lollygagging and group of three on rappels left us a few hours short. With darkness coming in an hour we decided to stop there to preserve the casual. We bivied on ledges by some snow in the gully. 13 hours. The third day allowed an even later wake-up and an extremely casual attitude as we almost moseyed our way up the last few peaks, including Middle Palisade, a great mid-upper 5th class climb followed by a knife-edge. We vegged on the summit for a very long time, eating and laughing and creating some fun summit register contents for you. Go find it! We then made our way down only mildly heinous loose-ish rock to Disappointment Peak, a flowing rivulet of fresh water, and eventually Southfork Pass in a very slow (or can we say casual?) five hours on the third day to finish the climb. 54 hours on route total. We chilled out at the pass and then at every opportunity on the hike out, and still made it to the car in the midafternoon. The Full Palisades is now Ben's favorite Sierra climb. Not as consistent in quality as the highly regarded Evolution Traverse—Full Pal's best parts are for sure better and its lows way lower. But it’s a lot more consistent in terms of difficulties; there are very few sections on Palisades that are not 5th class, whereas there is a lot more 2nd-4th on Evolution. Though they are both eight miles long, Full Pal has more up and down and more technical parts, meaning it is in essence 1.5-2 times as big in terms of time and difficulty. The Full Evolution Traverse has been done around 16 times since its FA in 1999; the Full Palisade Traverse less than half of that since its first ascent in 1978. They are both great, iconic routes of the High Sierra. Peter Croft chooses the Evo Traverse as the very best in the Sierra. But maybe he’d change his mind if he got the Full Pal experience? This Machine Kills Fashions. Casually. May 31- June 2, 2012. Dave Turner and Aaron Jones, 4 days, 2008. Full Palisades Traverse from afar, the main landmarks: Southfork Pass is the low point near the left. First big peak MidPal then Norman Clyde. PalCrest is the lowlong ridge in the middle. Sill is the highest looking peak right of center, then the other fourteeners including NorPal. Finally Winchell and Agassiz the dark peaks far right. Photo taken from Ancient Bristlecone Pine Forest.